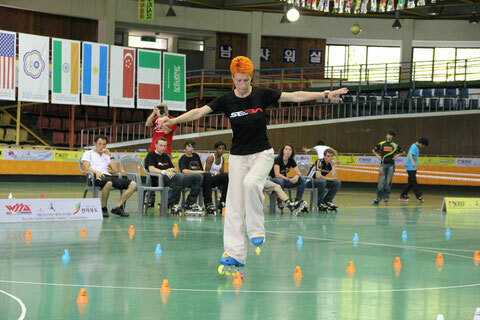 She's got her hair short and orange, she's got smurf-blue FR1 skates, and she is the most senior international competitor in Freestyle Slalom. But she is also – and above all – the new World Number 1 at the WSSA Ranking, a first place she took last September after a season during which she went crescendo. She started to draw attention to herself only last year, getting more and more often her ticket to the finals. But during last winter, thanks to the magic formula [super skating basics] + [daily indoors training], she turned into a frightening wheeling machine, whose technique makes most competitors green with envy!! She didn't miss a single final during 2010. Better still, she walked off with all the first places of the end of the season! So that she supplants Chloé Seyrès (fra) and Chen Chen (chn) – the two skaters who have been monopolizing the World's first place since the creation of the World Ranking. Figures show how tough the challenge was– and still is: currently, Marina and Chen Chen are level on points for their Best 4 (1300, which is the max), whereas Chloé is hot on their heels, only 30 points behind. • Job/Occupation: President of the Odessa Amateur Sport Association, slalom skater, and trainer. • A definition of Freestyle? It’s my hobby and my job. Freestyle slalom looks like figure skating around cones. It’s like a drug to me. • When did you start slalom-skating and how did you discover it? I started slalom-skating in 2006. Since 2004 I used to teach children how to dance on skates. During winter 2005-2006, I met some guys skating slalom. We shared the same sports hall together. They suggested me to teach slalom-skating to my pupils, they showed me some basic tricks and gave me a huge heap of CDs with slalom videos. And one month later, I organized a slalom section. • The reasons you decided to start training? I used to teach off skates: I'd show a slalom trick on video, and then explain how to do it and correct mistakes, if some. I could explain and show slowly the tricks I knew, but I didn’t practice. Once, one of my pupils said: "You first! Put on your skates and show us. If you are a teacher, you have to do this perfect." • How did you train and learn the basics? I saw videos with tricks then tried to repeat. I trained with a camera and always compared my performing with somebody else’s. • You improved very fast. What sports did you practice before? I was a figure skater for 12 years. There are two kinds of pairs in figure skating: dancing and sportive. Dancing - like a jam program in artistic skating, and sportive - like a jam program with acrobatic tricks. I was a sportive pair skater. I also practiced ballet dancing and I used to sky a lot. • Why do you do competitions? I decided to have a go at competitions in summer 2007. My first national competition was the Odessa Roller Festival and my first international competition was the World Cup in Moscow, in July 2007. Since that time, I’ve been taking part in competitions to check my condition in slalom, and to learn new things. • What are your best competition memories? All competitions and all trips are good memories. New friends, new countries, other cultures. And very good reasons to get extra holidays )))))). You won a good bunch of battles in a row this summer, including the World Championships in JeonJu. Thanks to your great results this year, you are the new Number 1 in Freestyle! 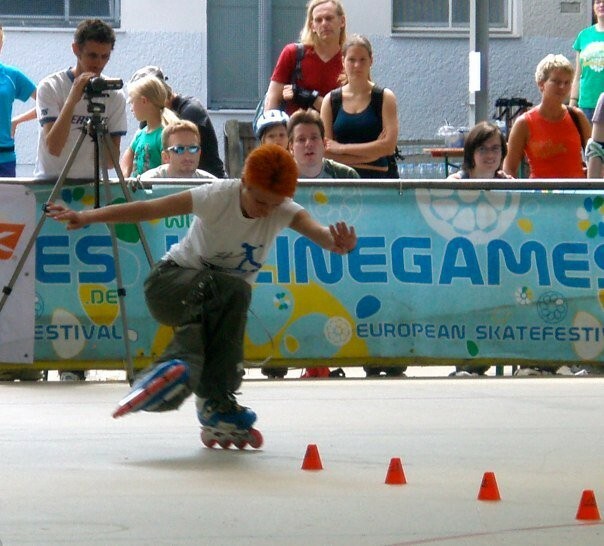 Only since the Inline Games in Berlin: on July 3-4-th in Kiev, I was 2-d behind Polina Semenova. Anyway, I didn’t think about winning. I wanted to show good skating, to be interesting for the public and for the judges, and manage all my new tricks and transitions. My 1-st place is a very big surprise for me. So, I’m happy. • Did you train differently than usual for the World Championships? Usually, my training sessions alternate with my working hours: for a couple of hours I give lessons, then the next couple of hours I can train, and so on. First I will practice freestyle, wheeling and spinning tricks, then the next session different combinations and something new, and in the end sitting tricks or best trick for battles, for example. Two weeks before the World Championships, I stopped working with my overweight clients and with children under 5. I started sleeping as much as I could, and trained 1-2 hours a day, before working of course. Video of the Womens Battle Final in JeonJu (kor) for the 2010 World Championships. 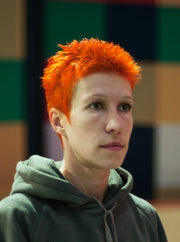 • Why is your hair orange? During my life I tested all colors. Orange is what I like best. • Which kind of tricks do you like best in slalom? It’s the stylish aspect of spinning tricks. 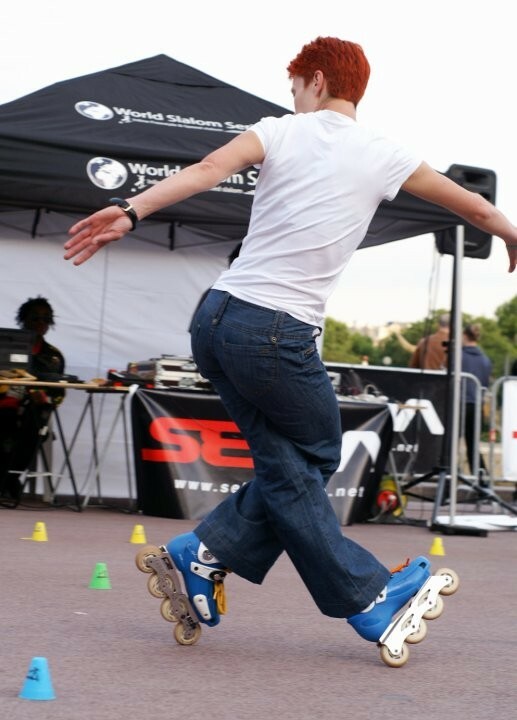 I have a second pair of skates – Seba high, the best for slalom I think, but I’m getting tired after 3 hours of skating. Whereas I can spend the whole day long with the FR1 on, whatever I do. So, taking my job into account, FR1 is better for me. • You’re a master in Battles. And what about Classic? Any preferences? No preferences, I like them both. I do battle for satisfaction, classic for soul. For me, classic starts from music, then I compose my program (freestyle only) and only after, I add tricks. To train for battle, I choose tricks that I’m going to show and I combine them in different successions, looking for an easy way to complete freestyle, technique and speed. • What do you do when you’re off-skates? Sleeping ))))))))))). I can’t imagine my life without skates. Now, I spend most of my free time with my family. Thanks to slalom my life has changed. I’ve got an interesting job and new friends. I’m improving and feeling better. Thanks to Syoma and Goga for their help. Thanks to my family for support. Thanks to all skaters and special thanks to you, Chloé for this interview.